Instagram is one of the fastest growing social media channels, especially among young people. Since Instagram is primarily a visual medium for posting photos and videos, many businesses and organizations haven’t figured out how to use it to promote their brand or increase web traffic. Yet, with care, you can pair great visuals with Instagram tools–such as your profile, captions, and hashtags–to grow your business. Phenom is a start-up app out of Cleveland that allows amateur athletes to share the products they love, their hustle, and their important moments. Their target demographic are young amateur athletes making Instagram a perfect tool for the company. I spoke with Phenom co-founder, Brian Verne, to learn how Phenom makes savvy use of Instagram to connect with their target audiences.Note: Not familiar with Instagram basics? This post by Grace Ling Yu will help you get started. Like any form of social media, you’ll get a lot more from Instagram if you do some planning before you start using it. Since users can go back and look at everything you’ve ever posted, all of your posts should look like they come from the same company or person Try to use a consistent visual theme that reflects your business’ mission and values. What’s the purpose of your Instagram account? Are you trying to drive traffic to a website, promote a product, share info, or increase the visibility of your business? Your purpose for using Instagram should shape how you create your posts. One of Phenom’s goals is to get people to download and use its app. Instagram doesn’t allow you to include links in the captions for individual posts, but you can post a link in your Instagram profile, so that’s what Phenom does. 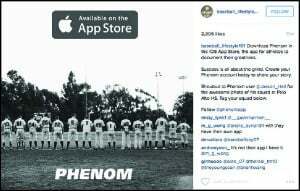 Here’s how Phenom is using its Instagram profile to drive downloads of its app. If you want to build a strong brand, your words, images, and tone of voice should be clear, consistent and compelling across all channels, including Instagram. Phenom scores on all three counts. Phenom consistently uses the same colors, fonts, and themes to pull it all together. Your Style: Your posts should imitate successful ad campaigns by using a consistent style and color scheme. Stick with a few filters. Quality is more important than quantity. Try to make each post a wow. Your Voice: Your posts should reflect the distinctive personality of your brand. Is your company serious or playful? Do you use emojis or abbreviations or is everything spelled out? Do the posts come from your CEO or owner or do various staffers speak for your business? Either way, conveying your brand’s personality will create a consistent and powerful message. 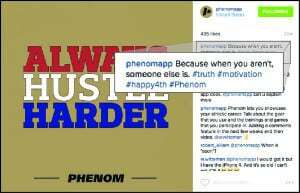 This post expresses Phenom’s aggressive, yet playful brand personality and makes effective use of hashtags. Hashtags are a critical tool for building a following. Instagram users find new people to follow by searching for hashtags that interest them. Instagram also suggests people you may want to follow. When you use several relevant hashtags per post, it makes it easier for like-minded people to find you. One of the best ways to find popular, relevant hashtags is to look at your most successful competitors’ accounts. What hashtags are they using? You can also find popular hashtags by going to hashtagify. If you’re a local business that primarily does business in one place, consider using your city’s hashtag. For example, if you’re based in Chicago, consider using #Chicago or #ChiTown. You should also create your own unique business hashtag. Whatever you do, keep your hashtags short, simple, and memorable. You want to make it easy for people to remember and type them. Phenom has only posted on Instagram 116 times to date, but they’ve already gained 13.1k followers. How’d they do it? Co-founders Brian Verne and Mike Eppich decided to sidestep paid social media advertising with a creative technique: influencer promotion. An “influencer” is someone who influences other people to think, buy, or do something. Digital influencers typically post a lot of interesting content and are extremely active on one or more social media channels, attracting large followings of people who read or view their posts and comment on or share them. Phenom works with both “amateur” and “professional” influencers. I think of amateurs as superfans who promote things they love on social media without usually looking to make any money (although recognition, free product, or a special perk are always appreciated). Professional influencers also promote things they love, but they often get some type of fee for using their social media accounts, blogs, or websites to share something with their fans. Customizing this user content on its Instagram account is much more effective than using a tool like the Repost App to share a post. Posting the content on your own website lets you involve your users, yet still keep their content “on brand.” In addition, you’re building a personal connection with your followers. According to Forbes, “Accounts that abruptly decrease their post frequency lose followers quickly.” This tactic also helps Phenom post a consistent flow of high quality images to its account. A promotional post on the baseball_lifestyle101 account promoting Phenom. Note how it still has all the proper branding. 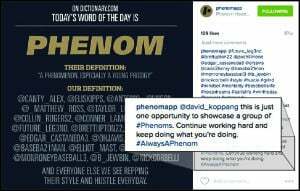 Phenom does pay some professional influencers a nominal fee per post. These professional influencers have their own digital platforms and followings with their own brand, so they prefer to post promoted content on their own platforms. They’ll usually incorporate at least some of the corporate branding and style of their sponsor into the post. Influencer promotion has been a cost-effective way for Phenom to build its following. They’ve been able to acquire new Phenom users for $0.20 each, which is about 15 times less than the industry standard. Phenom responds to a comment by one of their followers with sincerity and motivation.They certainly made a dedicated user with this one. “Be attentive and treat every follower as if it were your last,” advises Brian Verne. In my opinion, this attitude shows up in everything that Phenom does. When the president of a company personally reaches out or responds to your comment, it means a lot to most of us. Sure, it’s great to have high quality content that is consistently branded, but taking a few seconds to make a sincere connection with your followers is much more important. After all, people prefer to do business with people, not corporations. David Ludgin is a marketer, farmer, designer, and Instagrammer living in the Boston area.